I bought these turquoise espadrilles too many years ago to count. And they are still my absolute favorites. 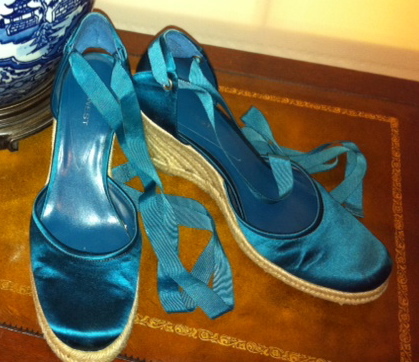 Nine West Satin Espadrilles [Circa 2003], similar here. Sadly though, I NEVER wear them. Well, I wear them rarely… like once a year. So, today I’m on the hunt for a loose, flowy, white dress that is the perfect length to show off my summer tan and my fabulous satin espadrille wedges. 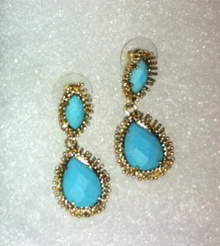 I think ShopBop’s Alice & Olivia pintuck dress topped off with the earrings my husband got me for our anniversary oughtta do it, don’t you? I have those Nine West espies in two different colors (that teal, and a pale cream/cold). They’re from 2006. Do you happen to recall the style name of those shoes? It’s driving me nuts. The style name is “Golan.” I keep all the boxes to my shoes, luckily! Oh, of course! I like that they’re closed-toed. They’re unquestionably summer shoes, but give you an option for when you’re pedicure is perilously chipping and you can’t be bothered to touch it up or repaint.